Thank you my dear friends for your lovely comments. Ladies email me for your coupon please. First weekend in November always brings SALE :). 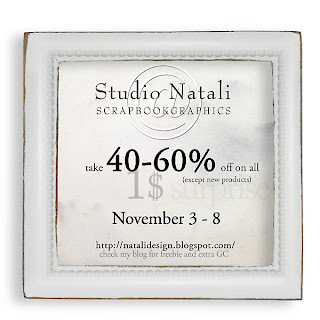 Come to celebrate Digital Scrapbooking Day with me and enjoy a minimum -40% off sale (except new products). Oh yah!! Thank you so much!! What a beautiful Christmas Pressie!! I adore it!! Ty and much love Naz. děkuji mnohokrát Vendulko! !Miluji vaše kity a tento mi udělal obrovskou radost.Krásný zbytek týdne.